New quad camera array is set to impress. The Huawei P30 is set to have four cameras on its rear, according to a new leak by a case manufacturer which shows of renders of the handset. Yes, we are in 'pinch of salt' territory here but the idea of four cameras on the back of the Huawei P30 Pro does make a modicum of sense. We have heard rumours of four cameras on its rear for a while now. In fact, it was Huawei European head Walter Ji who hinted of what's to come, explaining in an interview: "Next year we will definitely see more innovation in the camera, and now we have three, imagine four for next year." 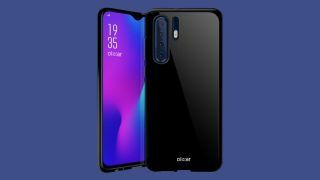 And now, renders from case manufacturer Olixar (leaked by MobileFun) show that the Huawei P30 Pro will have four cameras with a re-positioned vertical flash. The Huawei P30 is said to feature three vertical rear cameras. Interestingly, Huawei have seemingly opted to go with the waterdrop notch design for the P30 Range. This is entirely different to the new not 'hole punch' design that is being used in the upcoming Huawei Nova 4 and the Huawei Honor View 20. Apparently, this is because the Huawei P30 will feature an OLED display and the 'hole punch' design for OLED screens is only currently available to Samsung. As for those four cameras, it is thought that Huawei won't be chasing megapixels with the Huawei P30 Pro but instead go for a 38MP camera with a larger sensor. Megapixel wise, this is short of the 48MP camera phones that are coming out at the moment - the Honor View 20 and Huawei Nova 4 - and even lower than the 40MP Huawei P20 Pro. But the larger sensor means that Huawei could well be have the best camera phone around once again.